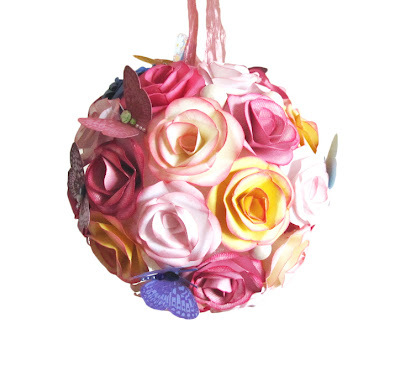 Over the weekend, I created this paper flower sphere out of 40 or so roses made from paper. Each rose was constructed from 5 layers of paper petals (drawn, cut, and inked by hand, then folded and glued in place). Gently hovering above the roses are little handmade butterflies, which I also made, using stamps, papers, jewel and pearl accents, and bits of wire. 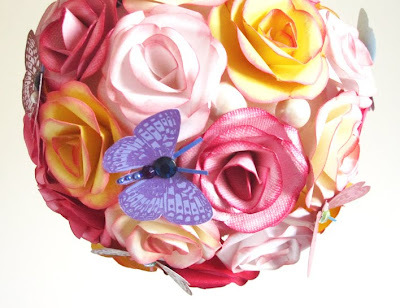 I used about 5-6 different shades of white, yellow and pink for the roses, and many other shades and patterns for the butterflies. This pretty thing hangs in my studio for now, and you can also find it in my Etsy shop. 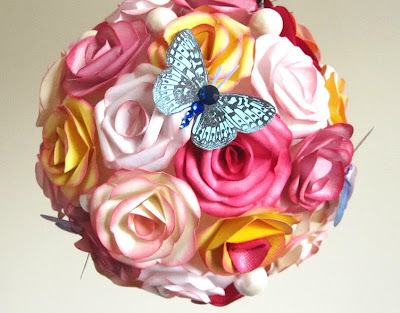 I'll be making more paper flower spheres in the next few days, so more pictures are coming. omg. PERFECT for weddings!!! you have to get these out there! wow... i never imagined you were this good.